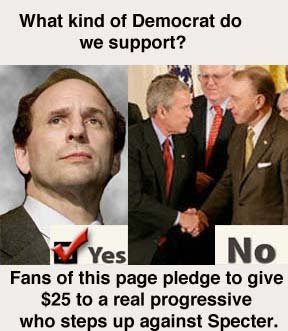 Group News Blog: Would You Step Up To Support a Progressive Challenger to Arlen Specter? Would You Step Up To Support a Progressive Challenger to Arlen Specter? We need Senators who will not shift with the wind. From "Open Left" where Adam begins the long list of Arlen Specter's history of being a politician who is mainly concerned with the survival of Arlen Specter rather than any real issue, any real concept. This is a man with a proven history of doing what ever it takes to gain, and hang on to power. tip o'the tinfoil hat to digby. Part of the disturbing nature of this whole thing is that Specter is considered to be a "moderate" in today's environment. When the moderates wear jackboots and support things like data mining, warrantless wiretaps, state secrets, and the odious "Unitary Executive" theory, the state of political thought and action in this nation is in some seriously deep kim chee.